Observation - FRESHWATER (RIVER) SHRIMP - UK and Ireland. Description: 20-25mm long shrimp like invertebrate swimming on its side in fast flowing stream with silty margins .Dislikes light drops into silt on being illuminated. 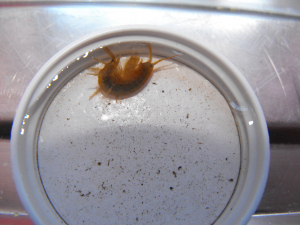 20-25mm long shrimp like invertebrate swimming on its side in fast flowing stream with silty margins .Dislikes light drops into silt on being illuminated.